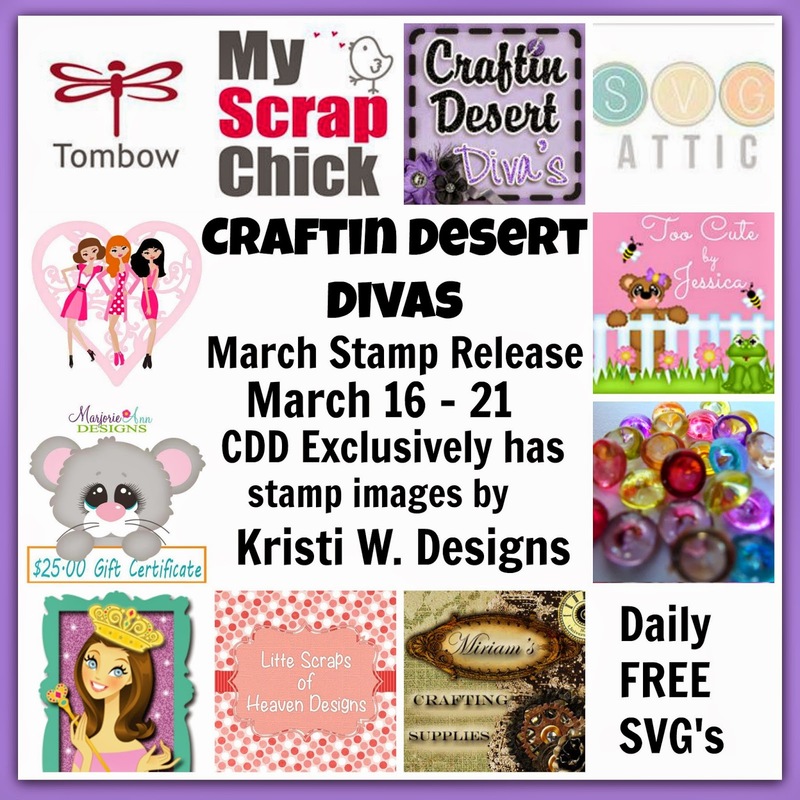 Today is Day 1 of the sneak peeks for the March stamp release at Craftin Desert Divas. We have 7 new stamp sets in this release. 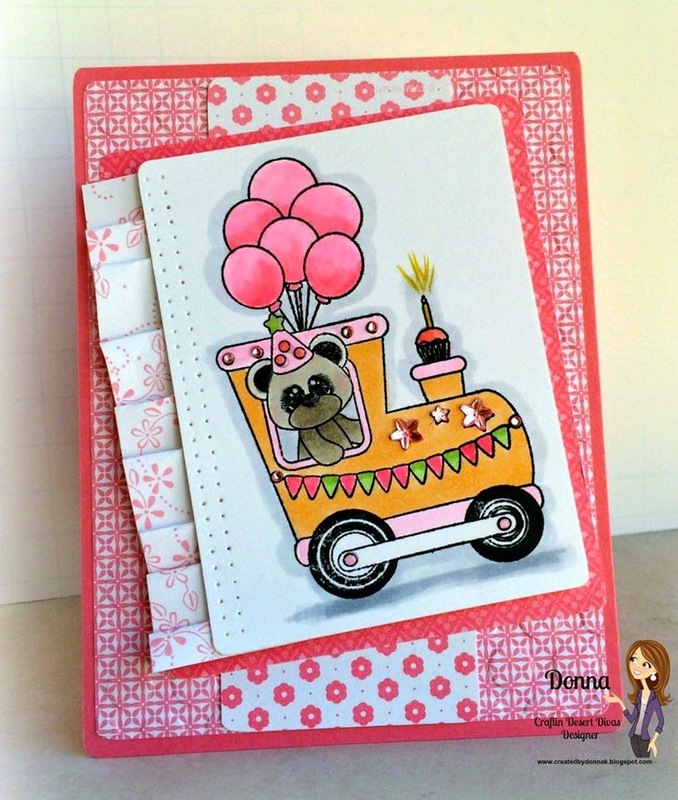 Craftin Desert Divas stamps now has an exclusive license with Kristi W Designs for stamp images. 1. Use Code: Birthday to receive 15% off your entire order. Sale starts on 3/20 and ends 3/22 10pm MST. Today we are showcasing 2 new stamps. How amazing are the DT ladies project today?? All I can say is WOW they have rocked this release! !So onto my project. I've created a ticket shaped card. I found both the card base and tracks in the Silhouette Store. The base to my card is actually a gift card holder but I just took out the slots for the holder and it made a perfect card base. 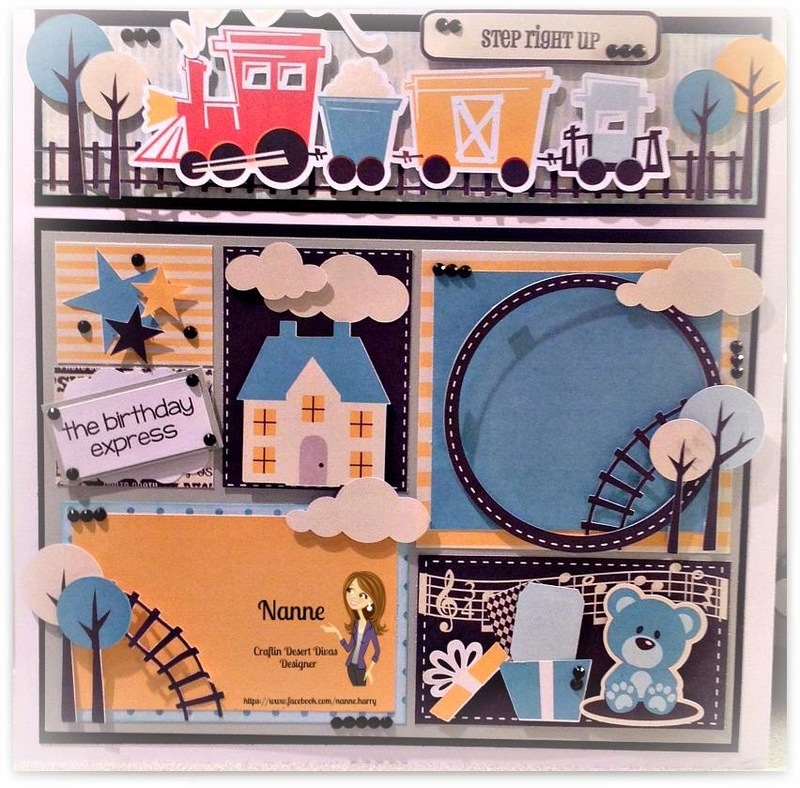 I just fell in love with adorable train set from Kristi's W images. I thought this set was a perfect way start out today's sneak peeks!! Today we are showcasing 2 stamp sets. 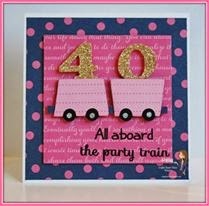 All Aboard is mostly a sentiment only stamp and Birthday Express has these super images. Both sets work very well together as they are all about trains!! 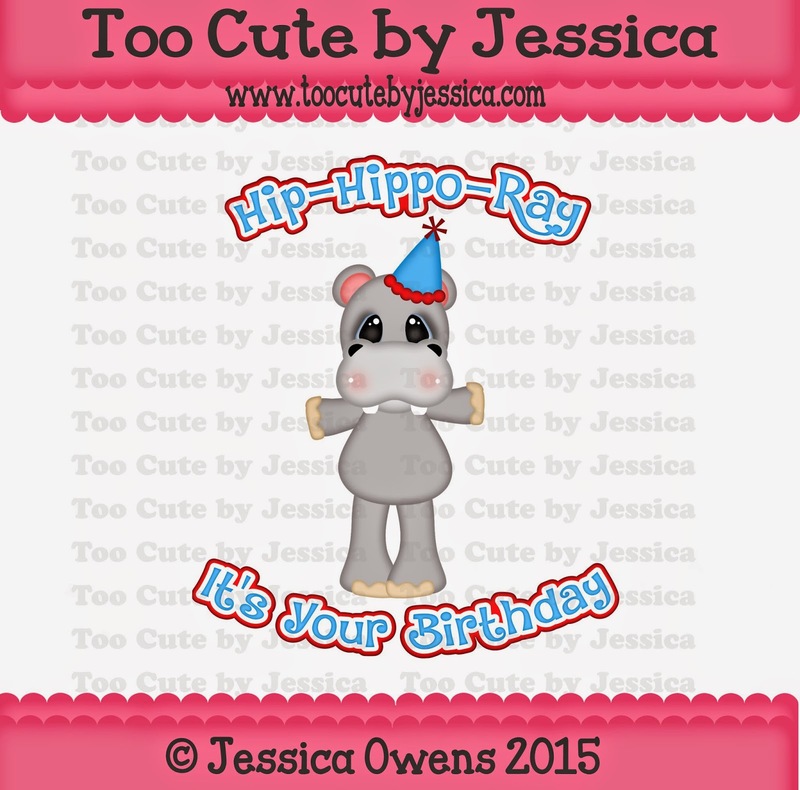 These both are just super for birthday party themes and so much more. I colored the train with my Spectrum Noir markers. I thought it would be fun to add a smaller ticket with a sentiment to the card. The smaller ticket shape is from my Tag It stamp set. The banner at the top of the small ticket is from the Birthday Express set. To finish it off I added another sentiment as there are lots of mix and match sentiments on these new stamps. Some sprinkles and my card was done. I love that the train track goes all the way around the card and the whole card is just awesome. super cute patterns, I love them all. So cute. Love your project. Thank you for sharing. Have a great crafty day. Great projects ladies. Looks like a lot of fun. o.k. Take my money NOW!!! Great 1st day projects.. They are all so cute. Great new stamps. Wonderful new release! You've got a very talented team! Adorable projects. So many color and great ideas. Thank you ladies! Fabulous card!!! I love all the inspiration from your hop today!! Thank you!! Love it ! I love the ticket shape! What an awesome idea! You are always amazing me! Thank you for sharing! Thank you all for the fabulous inspiration today. I know a few little kids that are gonna love getting cards similiar to these. Thanks for the amazing projects, they rock! Love them all. And the stamps are beautiful. Everyone's projects turned out so cute! Love them! TFS! 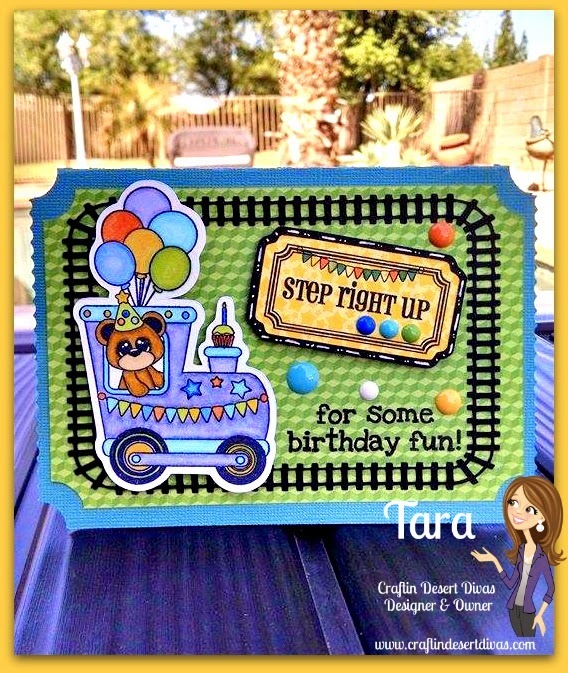 Super cute card Tara!! All the projects were fantastic and I think the new stamps are awesome so far!! Wow, fantastic card Tara. 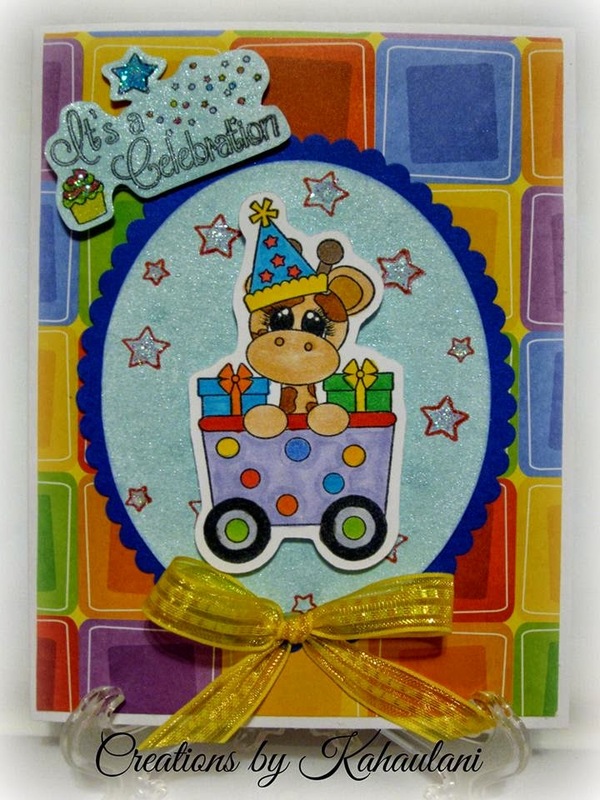 Love the beautiful bright & festive colors & the way you designed the tracks all the way around the card. I love all the sneak peaks today, they really show off these two sets in a fun way. Great Card super cute !! Awesome cards, so bright and cheery. Fabulous hop too!!!! Tara, Amazing card!!! And lots of super cute projects from your awesome design team!!! I love how all the projects turned out. Love the trains. Wonderful hop! 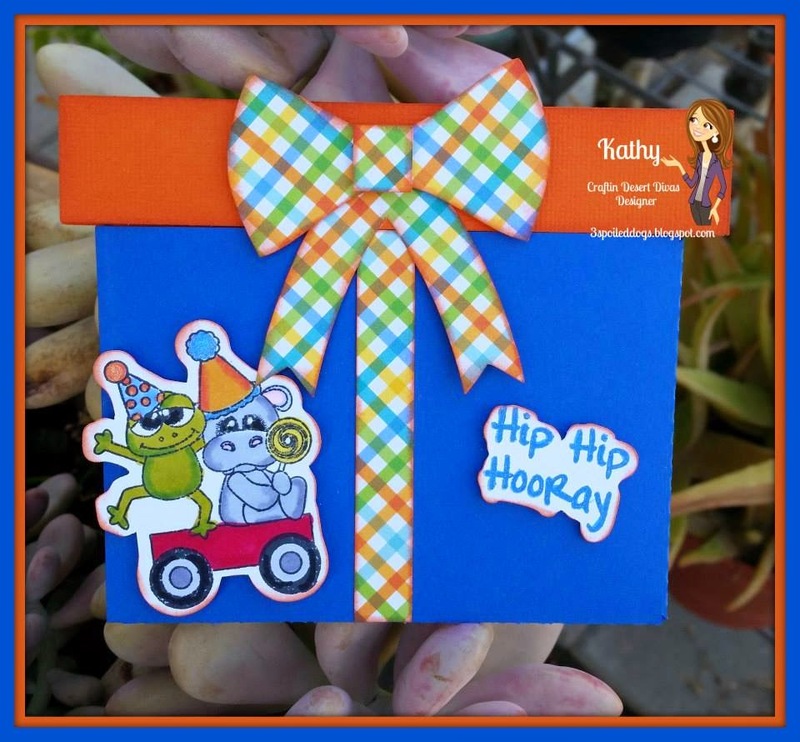 I love the bright bold colors of your card! So fun! Super fun Sets I love the train theme !! Great job by the DT!! 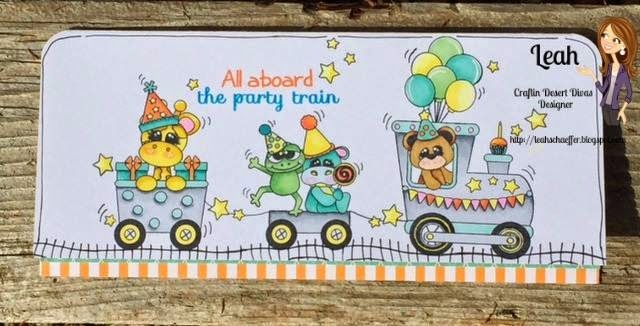 This card is so cute, it is such a fun card, love the added ticket, and the tracks! 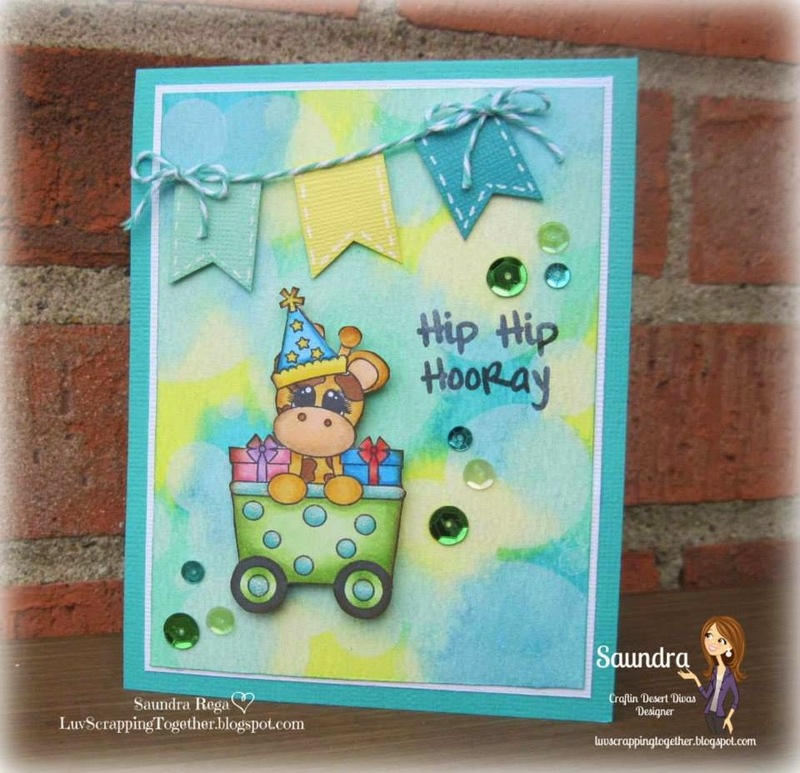 This will be a great hop because who doesn't need birthday inspiration! Such a cute card! This little birthday train set is adorable. Thanks to you and the team for all the great projects. Love all of the cards! The train is so cute! Your card is so neat with the train tracks going all around the outside! The DT did a great job on all of their projects too. What an adorable card. Love the tracks on it. Thanks for all the great ideas. Not sure if my post went through. Love the card and the train tracks. Thanks for all the great ideas. So Cute!!! Always great ideas! I am so excited for the stamp set! Love all of the cards! Such great projects! What a great hop. 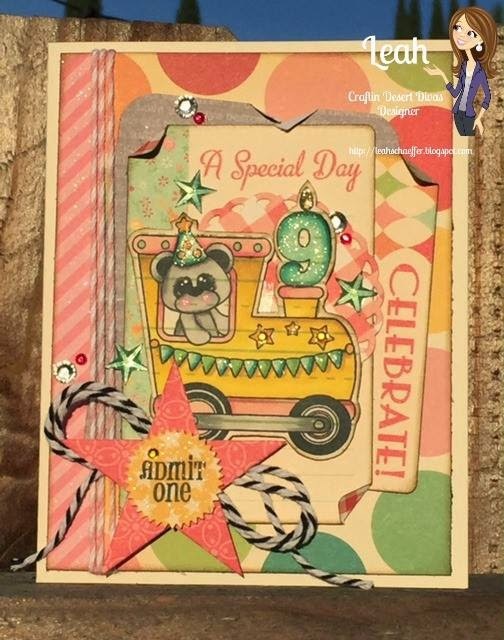 Love the train tracks on your card too! Great card! The train tracks really add to the card. Wow......fabulous DT inspiration! 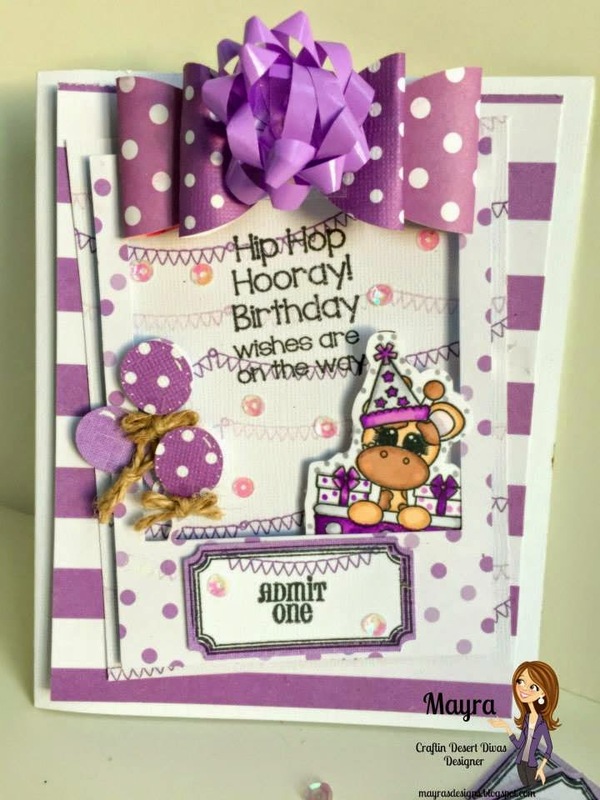 Love your adorable card Tara, its super cute ! Love your card!! Having grandsons the train theme is always a bonus!!! Adorable card. Super fabulous works in the hop. Just love your card, love how it's shaped like a stamp. all the hop projects are wonderful. 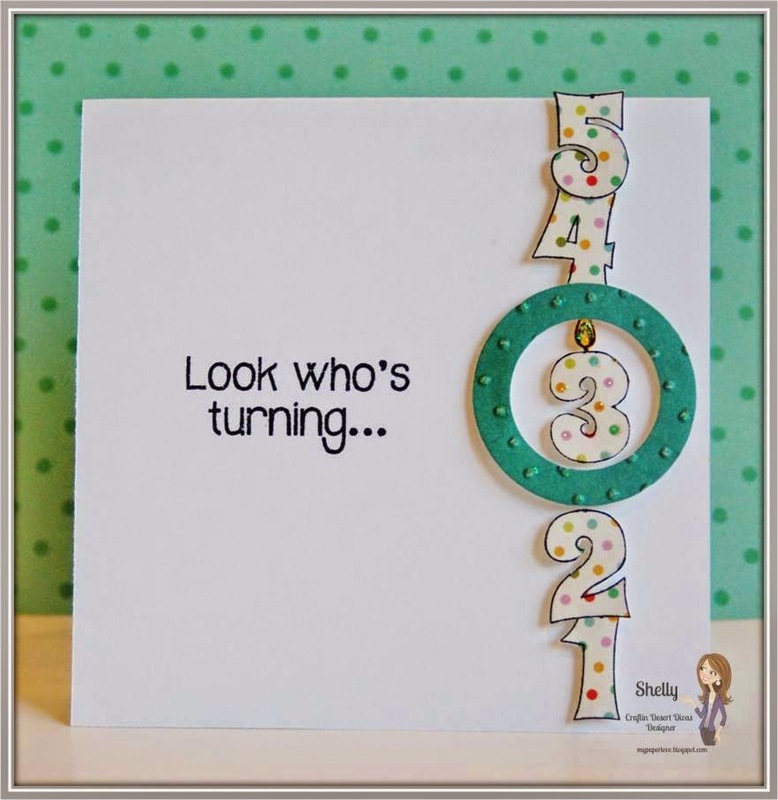 Tara your card is perfect for the stamp set !! Wonderful creations from everyone !! Your card is so adorable Tara! Love love love! Super cute!